Animal welfare associations worldwide believe that the over-supply of dogs bred for profit and sold in pet shops, is a major reason so many dogs end up unwanted and discarded to local pounds. We believe that too. 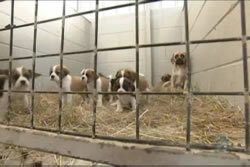 Pet shops (despite what they might tell you) only have a commercial interest in their ‘stock’ of puppies. These pups will almost always come from a ‘puppy mill’ – an evil place where dogs are kept in dreadful conditions, and kept only for their profit-making abilities. They live in small cramped cages, rarely see the outside, do not get adequate veterinary treatment and have little contact with humans. Parent dogs are bred over and over as a money making operation. 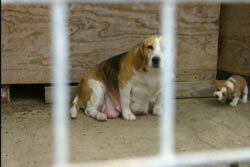 Conditions are poor because puppy farms do not care about dogs, they care about money, and profit. Decent conditions would eat into their profit margin. Many people who buy from Pet Shops ‘impulse’ buy. Information given by the pet shops is often inaccurate and in some cases completely wrong. So many of these dogs end up in the pounds. You can help. 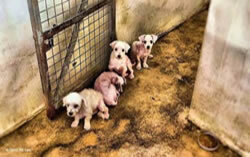 Go to these links and join the fight to close down puppy farming in Australia.